The daughter of a devoted dad who died after a road accident while driving to work at Nissan has paid a touching Valentine’s tribute. Twenty-six-year-old Alex Slark, from Washington, suffered serious injuries in a collision involving his BMW and other vehicles on the A1290 and later died at Newcastle’s Royal Victoria Infirmary in May last year. Now his five-year-old daughter Scarlett has been to the scene of the accident to leave balloons and her own message. It read: “A piece of my HEART lives in HEAVEN and he is my DADDY. 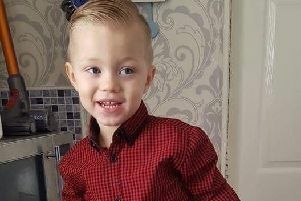 Scarlett’s aunt, Alex’s sister Stephanie McIntyre, said the family had been keen to mark Valentine’s Day in the same way Alex and Scarlett used to. She was his girl; the only girl for him and they loved each other so much. “They celebrated every single occasion together, buying cards and gifts. She was his girl; the only girl for him and they loved each other so much,” she said. “Scarlett had only said the other day ‘What will I do for Valentine’s Day, as I normally get Daddy a card but he is in heaven?’. “It’s a lot to come to terms with for all the family, especially Scarlett, as at five-years-old, how do you understand what death is? “It’s still so unreal for the family and the pain each day never gets any easier. We like to still celebrate all occasions with her and include her Daddy the best way we can so that she still feels like she is doing things for and with him. An inquest at Newcastle Coroner’s Court this week heard Alex had died of a ‘head injury, compatible with a road traffic collision’. It had been hard to revisit the events of last May during the inquest hearing, said Stephanie: “The family are heartbroken so much and reliving that night in detail has broken us even more.